I'll always remember the effect my first lesson had on me many years ago: It energized my body and relaxed my mind. I had found a great way to get a feeling of Africa right in my hometown. Why not try it yourself? To get started, you may want to read this. It gives you a quick overview of how to approach your new hobby. This DVD removes your fear of drumming by giving you a solid foundation in the privacy of your home. Find out why I think this DVD is the best choice for a beginner. Nowadays, most bigger music stores have djembe drums for sale. But finding the right one for you is a bit more complicated when you're new to the drumming world. Not all drums that are offered are authentic African instruments and not all retailers are clear about that. So inform yourself about the different types before you walk into a store! Buy a drum that you'll enjoy playing for a long time! 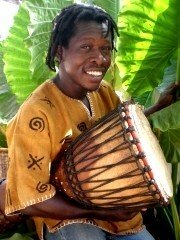 Kingy Mensah is an experienced drum builder in Ghana, West Africa. He guides you through this whole maintenance section and answers your questions. Ugly cracks can appear in hot and dry weather conditions. This doesn't mean the end of your drum, but needs to be taken care of. Here's how. If your rope is in very bad shape, you need to completely remove and replace it. Learn how to properly tie the knots back onto the rings. As a second step, you'll find easy-to-follow instructions on how to redo the verticals correctly. This is the typical type of bag that African drummers use in their homeland. Meet the guys that make these bags and get one for yourself, if you like. The Western Brand "Remo" makes bags that perfectly fit their instruments. If you have a Remo drum, this type of bag will suit your needs. Drum stands have advantages. That's why even Master drummers like Mamady Keita use them. Consider these thing to find the one that best suits your needs. 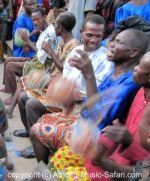 By the way, you'll also find lots of info on other African percussion instruments here.